I don’t own so many bags. But I’m quite happy since I’m not picky. I don’t also do matchy-matchy with my outfits and bags. But depending on the purpose of my usage, my bags changes – ie. I use my Adidas backpack when travelling to stuff laptop, camera, grooming kit, a book, and my planner. I think I have enough bag to match the feel of my outfits whether they be preppy, outgoing, sultry, or heading to Divisoria. The problem with me, once I transfer my bag’s contents to another, it takes quite a while before I switch bags. This is one of the reasons why I don’t often show my bag in my outfit posts. I will work on that someday. This is my bag at the moment. 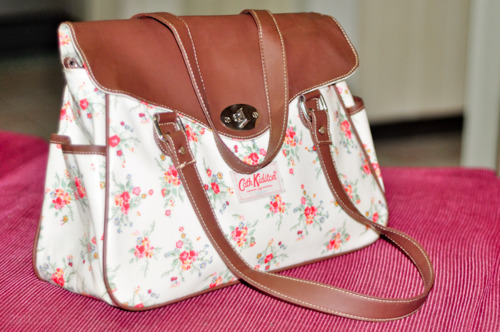 Cath Kidston floral PU bag. It’s just so adorable and roomy, I love it! 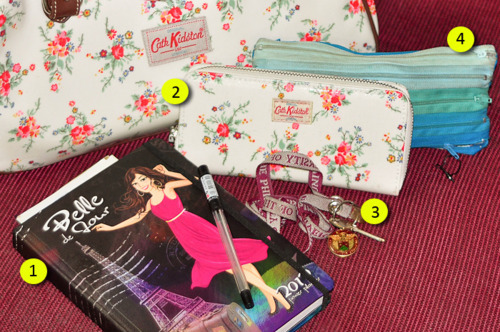 Belle de Jour planner – my first time to own one since in college, my daily activities would probably take up 2 days worth of space! and of course the camera I’m using to take photos of my bag! Nine items. And I’ve already removed some stuff. I decided I’d carry less in my bag. Usually, there’s my Nikon d90, my Victorinox swiss knife, and my small LED flashlight. 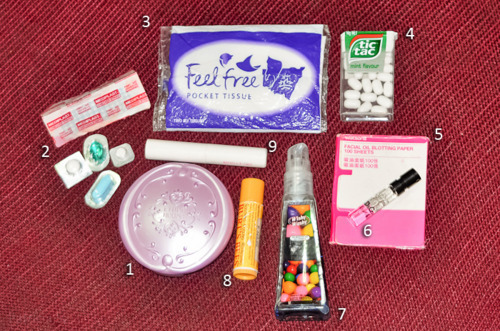 I could go camping with the contents of my bag! I’m still on the lookout for that perfect lightweight yet roomy bag that can go from day to night. The one that could double as a backpack or a shoulder bag. And is waterproof and sturdy. Must fit all of the above. I have a feeling this search will take long. Kuala Lumpur – Part 1: Selamat Datang!